Jenny and I set off on 20th October 2006 and joined a group organised by Egyptologist Nicole Douek who works for the British Museum and the Metropolitan Museum in New York. For a pleasant change we were not leading it. At Cairo we were met by my old friend Mohammed Marzouk who was to lead the expedition to the Gilf Kebir and Jebel Uweinat which lays across the borders of Egypt, Sudan and Libya: a pretty serious undertaking. There is no water, food or people living in the area, only snakes, scorpions, lizards, mountain goats and a few birds. It is too dry for camels. Everything we needed we had to carry. We left Cairo in five Land-Cruisers and took the long journey south-west through the Western Desert into the White Desert, a magnificent region of white rocky inselbergs rising like wierd-shaped meringues out of the sand. Sunset approached as we hauled off the road. High wind-torn clouds produced a magnificent sunset and while the others photographed Jenny and I threw a lot of watercolour paint around. I finished three sketches in rapid succession before we continued into the interior of the White Desert to rendezvous with the kitchen lads. 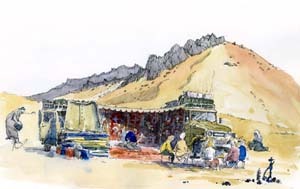 Hammada, the chief navigator, operating with GPS, was another old friend from a previous expedition, and by now in complete darkness he soon located the three kitchen wagons with a large open-ended mess tent already up. We were all up before dawn and as the sun rose between two great heaps of meringue I filmed, photographed and sketched before breakfast provided by Awayed the cook who produced the most delicious meals. He baked pitta bread on an old oil-drum lid over a wood fire. Following some exploration of the White Desert we then resumed our southern journey, our convoy expanded to eight vehicles, and soon reached the oasis of Farafara, a lovely old place. Alas, the police checkpoint decided to hold us up for some time, as is their wont, and when we were able to go we were encumbered with a policeman who shared the driver’s seat with poor old Saeed, our driver, who ranted and raged all the way into town. Of course we were a little confused over this. Was there something wrong? Were we having to go to police HQ for interrogation? We arrived outside an imposing building which had sculptures of camels and palm trees across its front – hardly the local interrogation chambers, but it was vaguely familiar to me. Inside we found Badr, the local artist, to whom I’d given some watercolours on my last visit.